I am sure you have seen the various heat straightening brushes advertised. The claims on these products is that you can straighten your hair faster and safer with these brush tools. The prices range from $19.99 up to $70, depending on the name brand. 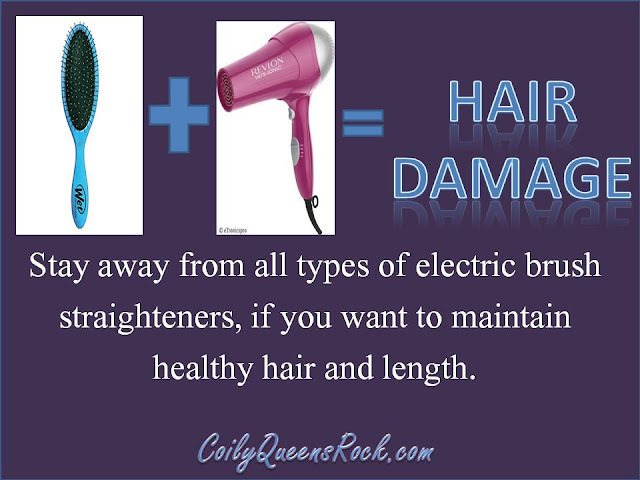 Certain electric brushes you can use to dry and straighten the hair at one time. This eliminate the need to blow dry your hair first. How does a electric straightening brush differ from your flat iron? In general these electric brushes do not get as hot as a flat iron can. You can expect more of a blown out look than a slick straightening, when use on wet hair. Is this a tool you should use on your hair or your child's hair? No, I do not recommend investing in this type of hair tool. If you are trying to grow your hair long, full and healthy stay away from brushes and high heat. The stress of the brush raking over your hair, combined with the high heat, will break your hair. With one use or repeated use you could thin your hair out or weaken your hair. This tool is not conducive to growing and maintaining long healthy hair. All harsh heat tools should used in moderation, when on a healthy hair journey. If you are still tempted and feel one of these straightening brushes will benefit you, then here are the top picks from amazon. These straightening brushes received great reviews on amazon. Check them out! The top 5 best products for your hair!